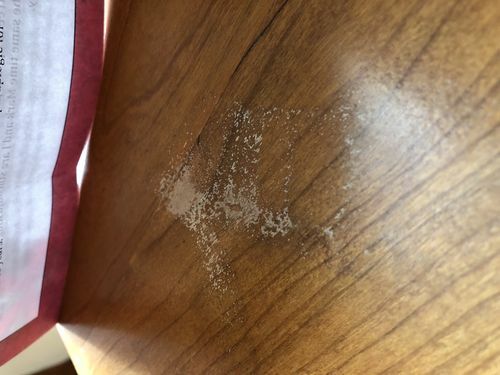 Problem with blemish—shellac with GF High Performance. This is GF high performance over de-waxed shellac. This blemish has appeared. I thought it looked like something stuck to the finish, but it seems too embedded for that. I’ve been rubbing with steel wool. I’ve had a lot of luck with this finish. I’m a bit perplexed. Any ideas? Are you willing to thin some of your topcoat and brush or rag on a little more finish? Maybe add a couple more pictures so we can get a better idea what it is. On rare occasion, I’ve had a finish turn white in spots, usually in extreme hot or extreme cold conditions. I feel like temperature matters, not just when applying the finish, but also for a period of time while it cures. In my case, I’ve always been able to correct the problem by applying another coat and re-buffing. I use lacquer though, which melts into the previous finish. On the next go-around I would wet sand the final coat with a 1200-1500 grit soft sponge and tap water once the finish is fully cured. Once you try wet sanding, you won’t go back to steel wool. I hope you find success with your project. Isn’t GF High Performance water base? you don’t use steel wool with water base products. Something hydrophobic got splashed on the wood. Definitely looks like a splash stain. Maybe before you ever got the wood. Did you buy it from a big box store? Mill it your self? was there a UPC sticker there? Somebody drop some wax or WD40 on it when you weren’t around? Don’t know. Bottom line you have to sand down the finish there and sand down to and thru the stain. then wash it with alcohol. Let it dry then test it. If it still shows thru either repeat or sand off all finish re mill and start over. Remember you have to sand a much wider area than the blemish to get a good blending and to get the appearance of flat surface. My 2 cents; .000376 cents at the lumberjock exchange rate. Isn t GF High Performance water base? you don t use steel wool with water base products. I have bronze wool for this reason, but I’m in the process of moving, and almost everythingtjingnisnpa Jed. This is something i made a while back, so I picked up some steel wool today to see if it would rub off. Good reminder to clean as well as possible. Oh, so this was an existing piece in use? Damage from a hot pan? Could be. It’s a desk about a year old. I am going to try a little HP—it supposedly dissolved into prior coats as well. I wouldn’t use hydrogen peroxide. It can chemically react with shellac and create Thermite. naphtha is a great cleaner and will remove most contaminants and usually, shellac will seal most contaminants off. where did hydrogen peroxide come from? HP = hydrogen peroxide. Seriously. It can spontaneously explode.